I completed my Bsc in physics with a specialization in electrical engineering in 2001, at the University of Dschang, Cameroon. The following year, I was admitted as a Msc student in Geophysics at the University of Yaounde I, Cameroon. My research project focused on the study of a sedimentary basin in southwestern Cameroon, using audio-frequency magnetotellurics data. The goal of this project was to delimit the western margin of the basin and to characterize low resistivity anomalies in the shallow basin. As a grad student, I developed a strong interest in geophysics, and I created with my classmates the University of Yaounde I Geophysical Society, a student section of the SEG (Society of exploration Geophysicist) to develop among the students activities related to geophysics, and networking with the industry. I completed my Msc in 2005, and after working for one year at the National Electricity Company of Cameroon, I obtained a scholarship for post-graduate studies at the African Institute for Mathematical Sciences (AIMS) in Cape Town, South Africa. Being a student at AIMS was a very enriching experience, both socially and academically. 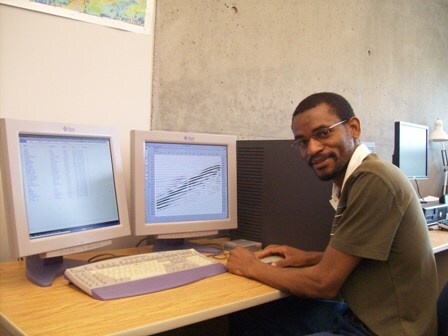 While at AIMS, my strong interest to geophysics led me to successfully apply for a PhD position in Exploration seismology, at Simon Fraser University (SFU), where I am currently, since 2007. Project: 2-D frequency domain waveform tomography of the Queen Charlotte sedimentary Basin of western Canada and the Seattle fault zone. My research project on the Queen Charlotte Basin (QCB), which is the largest tertiary basin on the west coast of Canada, focuses on imaging the shallow part of the basin, which includes the Quaternary, Pliocene and upper Miocene sections, down to approximately 1200 m depth, using waveform tomography. Waveform tomography is a geophysical imaging technique that provides high resolution qualitative and quantitative images of the subsurface. The project can be divided into three major parts: The first part consists in developing a strategy for a successful application of waveform tomography to marine seismic reflection data from the QCB, which can also be applied to seismic reflection data from other areas. Seismic reflection data are characterized by a relatively high starting frequency (for waveform tomography) which increases the non linearity of the inversion, and by a limited maximum offset. In the second part of the project, I applied the technique using four lines of the seismic reflection data collected in 1988 by the Geological Survey of Canada. The results show shallow faulting in the Pliocene strata, not readily identifiable on the conventional migration, and useful in complementing the interpretation of the tectonic evolution of the basin. More importantly, for the industry, the results show evidence of hydrocarbon bearing sediment in the Pliocene and upper Miocene strata in three different areas in Hecate Strait, gas chimneys and shale, confirming the high potential of the basin in oil and gas. The last part of the project consists of a set of elastic modeling checkerboard tests, used to better understand the quality of the results and their resolution limit. To verify the robustness of the inversion strategy successfully applied with the QCB data, I decided to test the technique in a different area, the Seattle fault zone.